Stony Holme Golf Club was one of several run by Mack Golf that closed down. Initially there were fears that none of the clubs would be saved but now most have re-opened. Carlisle City Council vowed to get professional help to keep the course viable, reports the News & Star, and that has come from Jim Douglas, who previously managed the facility for 20 years. He has vowed to bring the course and the neighbouring Swifts Driving Range back to life. 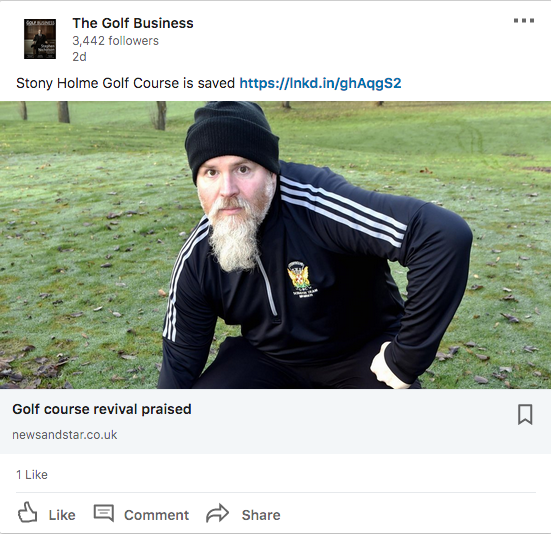 Former head greenkeeper Robin Little, who will act as an advisor to help get the course back on its feet, said: “This is great news for the club and good news for Carlisle, because it means the city has a site for grass roots golfers again. I wish Jim all the best. “Everything now seems to be quite positive,” said Stony Holme captain Mark Thompson. The maintenance commissioned by the city council has meant the course will be back in action far more quickly than would otherwise have been the case, he said. Mr Douglas warned recently that there is a tremendous amount of work needed to re-establish the course and clubhouse, but he was confident it will happen quickly. He thanked Carlisle City Council, grounds staff, reception staff, the golf club and its members.